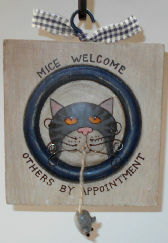 This wooden sign speaks for the cat when it says: Mice Welcome, Others By Appointment. 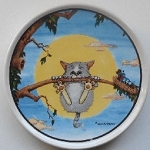 On this wooden sign the mouse has wire whiskers and there is a mouse hanging on a string held in the cat's mouth. The sign is 4 3/4" wide x 5" high x 1"deep. Metal hook at the top for hanging. Previously owned but in good condition.